The 2013 Red Cross Anne Arundel County Community Breakfast was held on April 23, 2013. Keynote speaker was America’s Cup Hall of Famer, author, philanthropist and lymphoma survivor Gary Jobson. This is the annual signature fundraising event for the Red Cross in Anne Arundel County. Three outstanding Anne Arundel County citizens were recognized at the breakfast for their commitments both to the Red Cross and to their community. The Next Generation Red Cross Award went to Chloe Fu, a senior at the Severn School in Severna Park. Chloe has organized two blood drives at her school resulting in enough donated blood to save nearly 300 lives. Wanting to do more and create something more permanent, Chloe founded the Severn School Red Cross Club which works to organize blood donation events and spread awareness about other Red Cross services. The Corporate Partner Award was presented to ARINC. Julie Seymour represented the company. Headquartered in Annapolis, ARINC is a major provider of transport communications and systems engineering solutions. ARINC has been a long-time partner of the Red Cross and recognizes the importance of encouraging their employees to give back to the community. Since 1988 these generous individuals have donated over $278,000 through their Workplace Giving Campaign to the Red Cross. 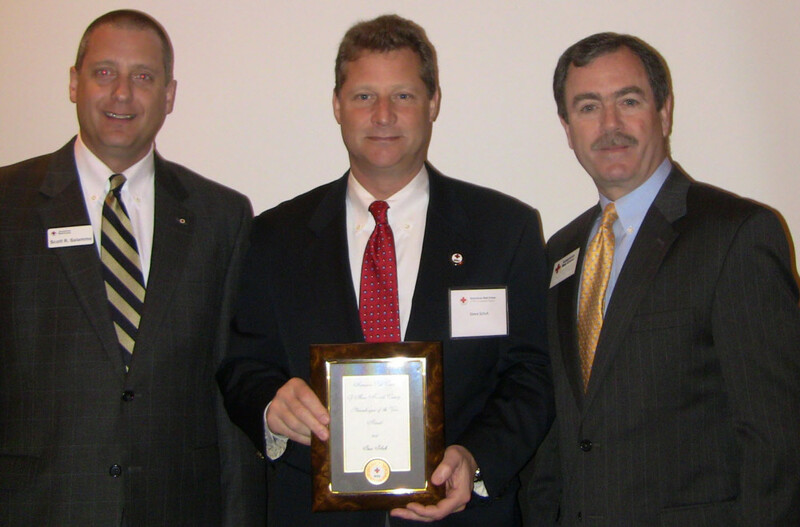 Steven R. Schuh was the recipient of this year’s Anne Arundel County Philanthropist of the Year Award. Del. Schuh represents District 31 in Anne Arundel County in the Maryland General Assembly and owns several local small businesses and is the managing member of Schuh Advisory, LLC. Del. Schuh is involved with several area nonprofits including the United Way of Central Maryland, Baltimore Symphony Orchestra, the Skywater Foundation and the Red Cross. Since 2004 Del. Schuh has donated multiple times to the Red Cross to support local efforts throughout Maryland and across the United States during big disasters like Hurricane Katrina. He is also past Treasurer and past Chair of the American Red Cross of Central Maryland. The Red Cross Anne Arundel County Community Breakfast was held at the Annapolis Sheraton thanks to lead sponsor CFG Community Bank and other event sponsors PNC Bank and Morgan Stanley.